I took my wife on a 10 mile rail-trail ride on the old mountain bikes to the Columbia Trail in High Bridge, New Jersey. The Columbia trail stretches for about 16 miles and uses the an old rail line that was running freight trains from 1876 until 1976. The South Branch of the Raritan River parallels the trail for most of its length. It was a beautiful ride winding our way up to Califon, New Jersey and the old train station there. There is really something quite nice about the forest in the autumn in the North East…even in good old New Jersey…no it is not all smokestacks and strip malls…contrary to popular opinion. The leaves crunching under our tires, the smell of the woods in general…beautiful. We both worked up quite an appetite, so pizza it was. Brick oven, Pizza & Pasta in Manville, Chef’s Special (love the garlic)…doesn’t get any better. And my beer on tap for this evening? 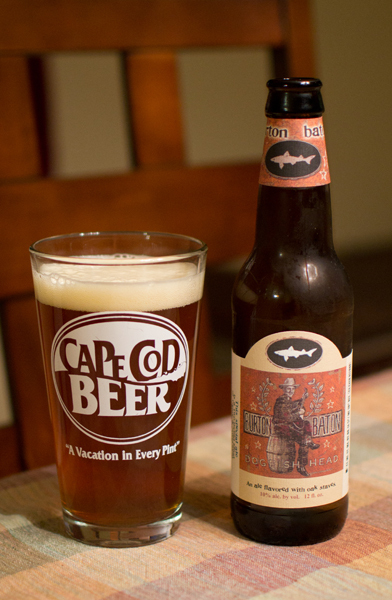 How about another brew from Dogfish Head from Delaware. Beer #328 is Burton Baton which happens to be an American Double IPA or an Imperial IPA. Heavy on the ABV, 10%, that seems par for the course with Dogfish. Interesting to note is that this is a blend of an American IPA and an English-style Old Ale. Appearance – A clear amber with a one finger-width off-white head that left some really nice lacing. Nose – Caramel malts and citrus…grapefruit mostly. It had a sweet aroma to it. A bit bready…like crust on Wonder bread of all things. I ate that stuff like it was going out of style when I was a kid. Taste – Starts with a bitter bite then mellows into sweet caramel malts. Pine and grapefruit then take over. The oak this is aged with shows through with a nice vanilla flavor that is pretty recognizable. The alcohol is hidden really well and doesn’t really start to show itself until the beer warms up. Mouthfeel – Medium body starting to tip the scales towards heavy. Not overly carbonated. It was a bit harsh feeling. TGIF…and boy do I feel like I could use a weekend right about now. 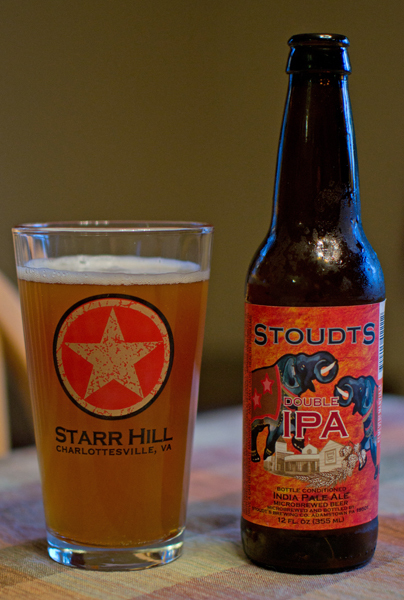 Beer #320 is Double IPA by Stoudt’s Brewing Company brewed in Adamstown in the neighboring state of Pennsylvania. This American DIPA or Imperial IPA has large ABV of 10%. I like the ANTMO style of doing the review…so I will continue. Apperance – Cloudy orange amber with a slight off-white head. Nose – Big & malty caramel struck me first. Pineapple juice, honey, herbs & alcohol make up the rest of the aromas. Taste – Nice and sweet with pineapple juice like flavor up front. Then it gets malty with the sweetness of the caramel. It had a pleasant bitterness…not too much or too little. There was a very slight alcohol taste that got a bit stronger as it warmed up. Mouthfeel – Fairly heavy body, a bit thick & a bit syrupy. Very smooth with it being a bit under carbonated. The ABV is hidden nicely. Overall – A very good DIPA. Not the best I have had but I enjoyed it. I liked the more noticeable pineapple flavor…it was quite the change of pace from the typical grapefruit. Pittsburgh, the home of the Pittsburgh Steelers and Mister Rogers’ Neighborhood is also home to East End Brewing Company. I find myself in the great “Steel City” this weekend for a wedding. I did a little research and found East End Brewing Company is just a hop skip and a jump from my hotel. Off I went to pick up a growler, a pint glass, and two 1 quart 1.8 fl oz of some of their finest beer. 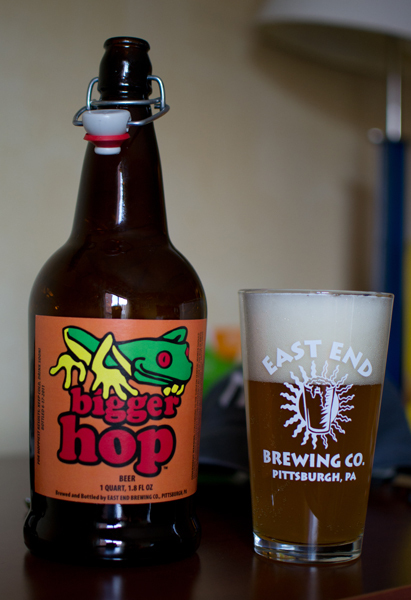 Tonights beer, #292, is Bigger Hop by East End Brewing Company. This American Double IPA or Imperial IPA has an ABV of 9%. Into my newly purchased East End Brewing Company pint glass went this hazy gold with a slight hint of orange colored brew. The off-white head was magnificent, large and fluffy. It left some awesome lacing on the glass. The nose was grapefruit juice, tropical fruit, and it was quite malty. The grapefruit hit me first in the taste…coming off slightly sweet. There was a nice bready malty thing going on throughout the flavor profile also. It had quite the bitter bite…which I love. The body was medium leaning towards heavy and sticky. It had a lower amount of carbonation and was bordering on being smooth. The alcohol was hidden nicely but at the end of the 1 quart 1.8 oz bottle, I was feeling like Mr. McFeely. This was a nice solid brew that I enjoyed as I was singing “It’s a beautiful day in the neighborhood…would you be mine? Could you be mine?”. I really can’t believe that summer is at its unofficial end. It seems like only yesterday it was Memorial Day. It truly is amazing how fast time flies the older you get. 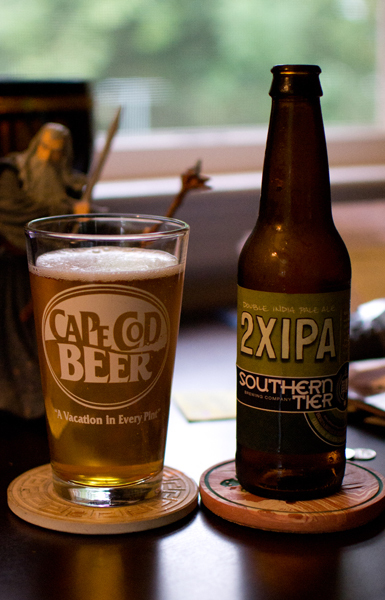 Beer #280 is 2XIPA by Southern Tier Brewing Company from Lakewood, New York. As the name suggests, this is an American Double IPA or Imperial IPA. 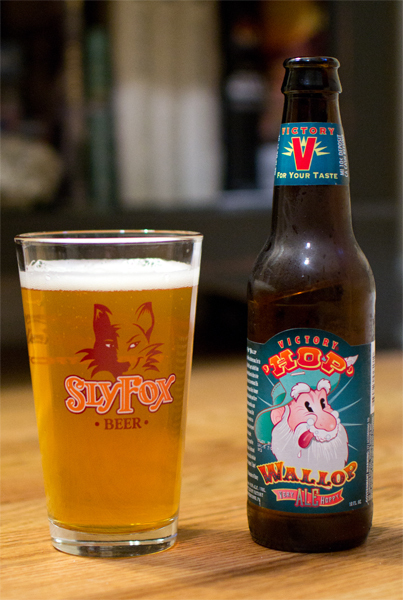 The ABV of this beer, which is brewed with four types of hops and three types of malts according to the label, is 8.2%. The color was odd to me, I was expecting something along the lines of a orange amber but this poured a golden yellow. A big fat fail was the head…I wanted the tiny white head here to be massive…it wasn’t. The nose was quite yummy though, with grapefruit and pine (pine being the bigger of the aromas), a tad bit earthy and nice and malty sweetness. I took a sip, the sweetness of the caramel malts kicked off first. The hops then kicked in about mid drink with a nice grapefruit like flavor. The back end is more hops with pine being the most noticeable flavor. It wasn’t all that bitter. It wasn’t quite as thick as I would have liked body wise…it had a medium feel to it. The carbonation was on the low side which made it quite smooth. The alcohol was hidden nicely here. The was a very nice DIPA that I would easily drink again…and again…and again. Ninety nine bottles of beer left in the blog…ninety nine bottles of beer…take one down…well you know the rest. After breaking in my new ride with a 20 mile ride today (only 6 were on twisty single track…the rest on the old canal tow path) I was quite thirsty. I stopped by the local liquor store and picked up something from Troegs Brewing Company I have never seen or had before. 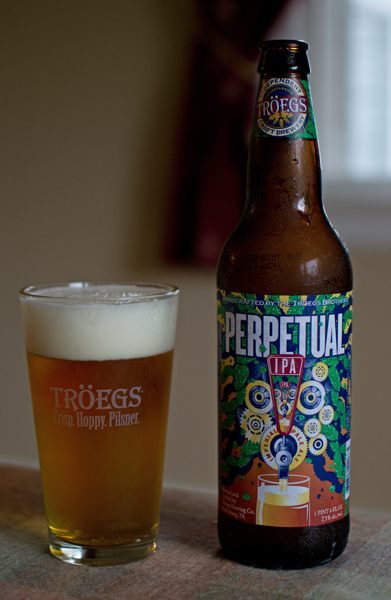 Beer #266 is Perpetual IPA by Troegs Brewing Company from Harrisburg, Pennsylvania. This American Double IPA has an ABV of 7.5%. Into my Troegs pint glass this went and the color was a clear deep golden yellow. The head was white and was quite massive. It left excellent lacing behind on the glass. The nose was heavy with citrus (orange), a bit of pineapple & herbs. It started off very bitter in the taste, which I love, and then mellowed out into orange flavors and near the back end, sweet bready malts. It finished very bitter again and a bit dry. It had a medium body, was nicely carbonated, and was a bit creamy. IPAs & DIPAs still continue to be my favorites styles of beer. This was no exception. I enjoyed this quite a bit as I did my new Salsa El Mariachi. Troegs is one fine Pennsylvania craft brewer and I’m very glad I live in an area where I can enjoy their beers. Today is another milestone on my journey to drink 365 beers…beer #265. That means there are only 100 beers left to go…hooray for me! It is all downhill from this point on. Beer #265 was 120 Minute IPA by Dogfish Head. I have wanted to try this beer for quite some time and I finally got around to trying it in none other than Delaware which is where this American Double IPA or Imperial IPA is brewed. I found it on draft at BBC Tavern & Grill in Greenville, Delaware. We had to kill some time waiting for my new bike to be built (at Garrison’s Cyclery)…so eating a delicious burger (cooked medium) and a beer seemed liked a great idea…and it was! 120 Minute IPA is very strong with a listed ABV of 15 to 20%. The waiter thought it may have been around 17.5%. It came out in a glass quite a bit smaller than a typical pint glass (the other smaller glass in the photo was a sample of Heavy Seas Loose Cannon IPA) with a clear amber color and a small off-white head. The nose was very interesting…very herby on first whiff. I thought I smelled basil and I had my wife smell it and she got the same herby basil like aroma. I also got alcohol, honey, sweet caramel malts, grass, and an orange like scent. There was a lot going on here in the nose. I took a sip and the the alcohol hit me first. It then got sweet, fruity (oranges and even some apples) and syrupy. All throughout was that spicy herb presence that I could best equate to basil. It finished off with a nice alcohol warming sensation. It was very heavy, syrupy, sticky, and very smooth. The carbonation was really quite low. 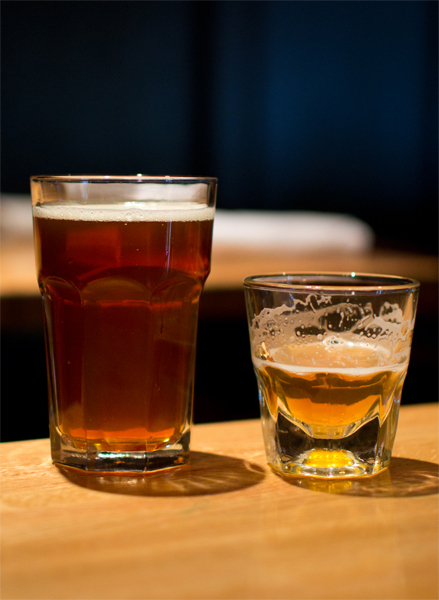 It was a sipping beer for sure and at times it felt more like I was drinking liquor. I think we sat at the restaurant for an hour and twenty minutes before I finished the glass. That wasn’t because I didn’t like it but I had to test ride a bike and drive home for two hours. If I would have drank that any quicker, I would have been useless for the rest of the day and my wife would have been pissed. Overall I enjoyed this immensely but one in a session is more than enough. It had a nice range of flavors with the basil being quite unique and even with the high alcohol content, those flavors still shined through…to me it was quite delicious. I am glad I had the opportunity to try this as I hear it is in a very limited release. I even here there are places where this high ABV brew is not legal…interesting. If you have the chance, I say try it but be warned…it is expensive and is not for everyone.